young scientists change the world. The vagus nerve, also called 10th cranial nerve, is a major component of the autonomic nervous system and plays a key role in regulating metabolic homeostasis. It also has an important role in the neuroendocrine-immune axis to maintain homeostasis through the afferent and efferent pathways. Vagus nerve stimulation (VNS) refers to any technique that stimulates the vagus nerve, including manual or electrical stimulation. cVES is a novel contact-free bioelectronic medicine that can prevent and treat age-related chronic diseases by utilizing physics, biology and bioelectromagnetics. The principle of cVES therapy is to stimulate the vagus nerve with mild electromagnetic signals to rapidly recover the balance of the autonomic nervous system, thereby improving or restoring the functions of the brain, cells, organs, body, etc. The activity of the autonomic nervous system is closely related to sleep efficiency. 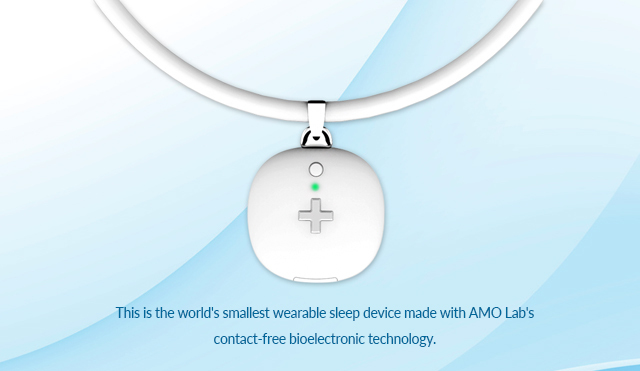 AMO+, the first product of AMO Lab, is an innovative consumer wellness product that activates the parasympathetic nervous system of the autonomic nervous system using milld electromagnetic signals with extremely low frequency to induce natural sleep by reducing stress and stabilizing heart rate and respiration rate. AMO Lab keeps studying the potential of bioelectronic medicine to create a better, healthier world. Please feel free to contact us if you would like to discuss the benefits of our platform with our team. CopyRight ⓒ AMO Lab Inc. All Rights Reserved.